Prepayment meter users pay on average £300 more than customers on direct debit. The CMA propose to decrease this difference by just £75. 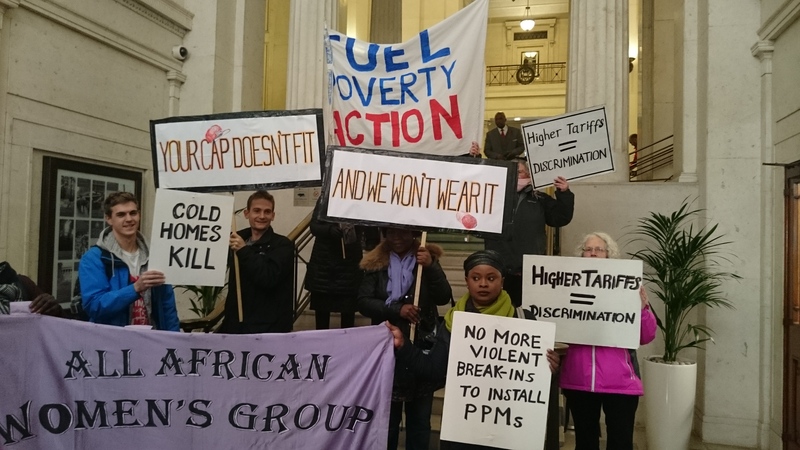 In their response, Fuel Poverty Action demanded parity, a position which has been endorsed by a series of other organisations.ii FPA handed in the response in the lobby of Victoria House, in a tiny doll’s cap, to highlight the insult of the CMA’s insufficient proposal. Passing on the cap containing a scroll with the response, Ruth London of FPA told Project Director Erika Lewis, “Energy companies’ license conditions forbid discrimination against users of PPMs, the CMA’s own Roger Witcombe has declared, ‘It is unacceptable that 4 million households on prepayment meters, many of them vulnerable, face higher bills than other energy customers,’ and yet the CMA’s proposals will perpetuate this injustice.” Erika Lewis, for the CMA, agreed that the proposals are not set in stone and promised that they would take seriously the evidence provided. Given the rife exploitation of customers by the energy industry, Business, Energy and Industrial Strategy secretary Greg Clark has promised to “deal with this problem”. Fuel Poverty Action are therefore today sending a letter to both Greg Clark and Theresa May to ask whether they genuinely intend to challenge an industry that has had a free pass for so long, or will they bring in measures like the CMA’s cap, that sound good on paper, but in practice leave us in the cold. As well as costing more, PPMs are often forced on people, sometimes by break-ins to their homes. One such case is that of Josh Hull of Windsor who came home to find his front door lock broken – hea thought he had been burgled. He then found his payments debited for a previous tenant’s debt – a common problem – and is unable to use his electricity. Aside from the cost, he says the anxiety and sleepless nights are draining, and have harmed his performance in a new job. He is ready to speak to the media. Previous PostPrevious Prepayment justice – Callout for testimonials and support! Next PostNext Pre-payment meter cap don't fit.